(Toronto, January 27, 2009) The Art Gallery of Ontario will offer visitors a rare glimpse into the life and work of one of the most celebrated artists of the 19th century when Sin and Salvation: Holman Hunt and the Pre-Raphaelite Vision opens on Valentine’s Day. 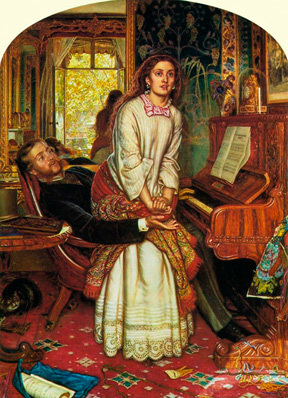 William Holman Hunt’s works explored the most critical social and political issues of his day – such as the role of women in society, gender relations and the crisis of faith – changing the course of Victorian art. Born in 1827 in London, England, Hunt attended the Royal Academy in 1844 where he met John Everett Millais and later Dante Gabriel Rossetti. In 1848 these three artists formed the Pre-Raphaelite Brotherhood, which broke with academic tradition and developed a distinctive medievalizing style characterized by bright colours and hyperrealism. Hunt enjoyed great success early in his career. In 1853, he underwent a religious conversion while painting his most famous work The Light of the World. Shortly thereafter, he embarked on his first journey to the Middle East in order to imbue his biblical scenes with archaeological accuracy. Hunt would return to the Middle East several times, spending a total of seven years in the region. One version of Hunt’s The Light of the World travelled around the British Empire in 1905, stopping in Toronto, and another was shown at the Canadian National Exhibition in 1935. The image inspired stained glass windows in churches throughout Ontario. “I am fascinated by the way Hunt explores moments of insight or revelation that change the lives of individuals or the course of human history, and his combination of exquisite workmanship with bizarre subject matter and psychologically penetrating content. The issues he addresses are as relevant today as they were in his own day,” says curator Dr. Katharine Lochnan, Deputy Director of Research and the R. Fraser Elliott Curator of Prints and Drawings at the AGO. Hunt developed close ties with several prominent figures in Canada, notably Sir Edmund Walker, founding president of the Art Museum of Toronto (now the AGO); Charles Trick Currelly, the first director of archaeology at the Royal Ontario Museum; and Henry Wentworth Monk, a leader in the non-Jewish Zionist movement, whose portrait by Hunt is included in the exhibition. Sin and Salvation: Holman Hunt and the Pre-Raphaelite Vision features more than 60 of Hunt’s most famous paintings, including The Awakening Conscience, The Light of the World, Isabella and the Pot of Basil and The Finding of the Saviour in the Temple. The exhibition also features works by other leading Pre-Raphaelites such as Dante Gabriel Rossetti, John Everett Millais and their associates Arthur Hughes and Ford Madox Brown, as well as textiles used in Hunt’s studio from the Royal Ontario Museum, and documents from the Thomas Fisher Rare Book Library and the Robertson Davies Library in Massey College at the University of Toronto. The works of the Pre-Raphaelite Brotherhood are among the most popular in British museums and are rarely lent. Major lenders to this landmark exhibition include Tate Britain, the Birmingham Museums and Art Gallery, and the Manchester Art Gallery. North American lenders include the National Gallery of Canada, the Cleveland Museum of Art and the Minneapolis Institute of Art. The exhibition is accompanied by a fully-illustrated book, which features insightful essays by interdisciplinary specialists in Britain, the United States, New Zealand and Canada, and is co-edited by Katharine Lochnan and Carol Jacobi, Leverhulme Fellow, National Portrait Gallery in London. The AGO is the only Canadian venue for this international exhibition conceived and organized by Katharine Lochnan. The exhibition opened last October in England at the Manchester Art Gallery, and will be seen at the Minneapolis Institute of Arts from June 13 to September 6, 2009. This exhibition is on view until May 10, and is included with admission to the Art Gallery of Ontario. Sin and Salvation: Holman Hunt and the Pre-Raphaelite Vision is organized by the Art Gallery of Ontario in association with the Manchester Art Gallery. The exhibition is supported by the Department of Canadian Heritage through the Canada Travelling Exhibitions Indemnification Program.